How Many Calories Are in a Deviled Egg? Registered Dietitian Kendra Gutschow combines her communications and nutrition expertise by translating scientific research for consumer media, most recently for the communications department of the American Diabetes Association. Gutschow completed the coordinated program in dietetics at the University of Texas and holds a Bachelor of Science from Vanderbilt University. Whether it's a backyard barbecue or a holiday buffet table, deviled eggs are likely to be appetizers at many functions you may attend year round. Deviled eggs are packed with protein and can be a healthier choice than some other party foods. But, making them yourself might be an even smarter choice. Traditional deviled eggs are prepared by scooping out the yolk of a boiled egg, and combining it with mayonnaise and other ingredients, such as mustard and herbs, for flavor. 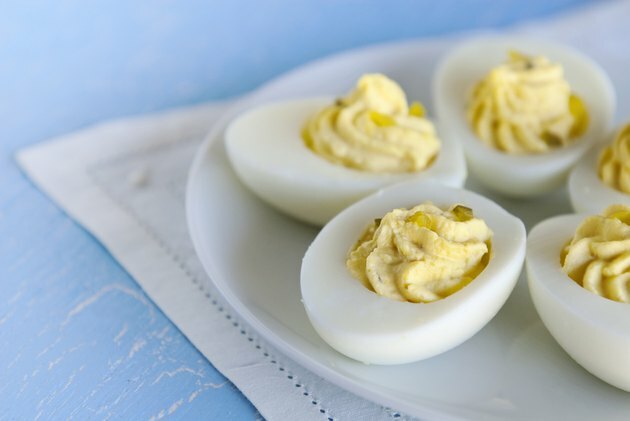 While one large boiled egg contains 80 calories and 5 grams of fat, a typical deviled egg can contain more than double the calories per serving. A variety of methods will cut the fat and calories in deviled eggs. Look for recipes where some or all of the mayonnaise is replaced by plain yogurt, low-fat sour cream or light cream cheese. Some of the egg yolk can even be removed and replaced with these ingredients.